I am pleased to announce another new offering from Dominican Liturgy Publications. 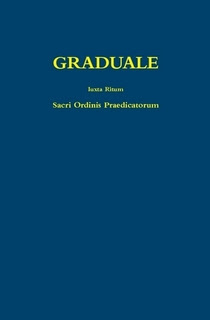 We have just reprinted the Graduale iuxta Ritum Sacri Ordinis Praedicatorum, originally published by the Order in 1950. This was the last edition of the Dominican Gradual. It contains the Mass Propers for the Entire Year, as well as those of Votive and Ritual Masses. In addition it includes the Dominican Kyriale, with all the authentic medieval Dominican Ordinaries and the music for the responses at Mass. The on-line publication page limit (800 pages) required that we omit the supplement with extra Roman chant Mass Ordinaries, but as these are widely available both in published and electronic forms, this seemed a small price to pay for making this book available. The volume is hardback, lies open easily, and has 800 pages, including the general index. The price is $35.25. When a used copy of the original edition can be found on the market, the price runs between $50 and $125, so this a very economical alternative. Although this is a scanned reprint the quality is quite good. You can see what the printing looks like using the "preview" on the order page. If you would like to purchase over 20 copies for your choir, I can offer a discount price of $33.00. Please write me directly (my email link is on the left sidebar at Dominican Liturgy) about this and other discounts for larger bulk purchases. (This discount is not available when ordering direct). May reprint make this music better known in our Dominican churches and among choirs who perform Dominican chant. More information for this book is at this link.